HOW DO I GET RID OF OPOSSUMS? The best way is physical trapping and removal. It is a fact that opossums are much easy to catch. They're not very bright. They have got the lowest brain mass to body mass ratio of any mammal and they rummage for food, so they're caught without effort. However, as usual, trapping can have uncertainties. If you've got an opossum in you territory, will you catch the opossum or some other animal? Will you be able to legally relocate the opossum? Will you take the required safety measures and the proper precautions? Is it legal for you to do so in your locality? It is recommended that you hire a professional wildlife control operator to help you with your opossum issue. This is for your and the animal's safety and legal reasons, and because wildlife control is a complex field and a specialty. Coming in contact with your pets. Stealing food of your pet or from your bird feeder. Can turn up in a shed or deck. Can turn up in an attic or wall. Can turn up inside house or basement. Can turn up in a trailer or mobile home. Dying in the walls or attic. Carrying and extending fleas to pets. Spreading droppings on property or in attic. Getting rid of opossums in the lawn or open spaces is not an easy task. These animals are not picky when it comes to looking for food and rummaging. All lids on the trash cans outside should be secured as tightly as possible as a Los Angeles possum control method. Trash cans with side locks are preferable. Smelly but effective, fox urine placed in the yard may help to repel them. Predator’s urine may sometimes help in repelling the opossum, especially if it is a mother with babies, from setting up home in your territory; however, it is likely that they will also figure out in some time that there isn’t a danger and return to set up residence again. Some people like to use ammonia in order to keep the animal away by saturating rags in the chemical and placing them around the frequently visited spots. These homemade methods not work for long and it is likely that this will only be a temporary solution. The best way of getting rid of an opossum is to capture it in a live trap so that they can safely and harmlessly be sent to another area where they can continue to survive; just not in your residence. Opossums are not used to bright light since they are nocturnal and they become active as the sun sets. Call for professional help and get one of the traps and make sure to inquire about the local laws for trapping wildlife. Bait the trap with almost anything. Opossums are scavengers and not too selective about their food. Remember, they do tend to carry many diseases and bacteria so wear hand protection and exercise caution when capturing and dealing with these animals. If you know from where they are entering your home, try and close off their entry point. Using steel sheet to cover the hole is always great. Chewing on the steel sheet tears their gums and keeps them from chewing. A copper mesh that also works well. Make sure you scan your home really well for these entrances. Get rid of their food source by ensuring that the trash cans have lids that are sealed well. Do not leave scraps and other foods around for them to have. Traps are the optimum solution in order to get rid of opossums safely and have them relocated to an area that will allow them to survive without creating problems in human livings. 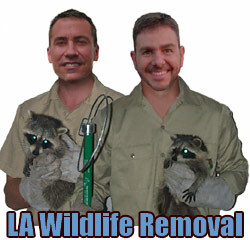 There are no effective opossum repellents for Los Angeles opossum removal. But some used are mothballs, ammonia, coyote urine, high-pitch ultrasonic sound blasters, regular radios, etc, to get rid of opossums, but they do not work much efficiently.